One of my favourite things is teaching people how to spin, passing on a passion of my to someone else and watching them run with it. On Saturday I got to meet a lovely lady, Lesley who was so enthusiastic and keen to spin that I knew she would just love it. We had a fantastic day, I think I enjoyed it more than Lesley did. One of the things Lesley said was that she'd looked for a while to find a spinning teacher in the North West, which is such a shame because there are plenty of spinners in this area, we just need to shout a bit louder. So, if you hear of anyone wanting to learn, I have workshops at Knit-Wise in Ormskirk, a shop where you can knit, quilt, make felt and every other craft inbetween. I'm also at Pendle Stitches, Moor Lane in Clitheroe. Liz is the area representative for Ashford, so there's a great opportunity to spin and try out different wheels before you choose which is the right one for you. Pendle Stitches have just expanded into the next door shop, so it's airy and bright and a wonderful place to learn. I also teach at Knitting Heaven in Leyland, a little treasure trove of yarn with Linda at the helm, it's a happy place to learn. There's plenty of coffee to help you concentrate and loads of yarn to inspire you. And last but by no means least, I teach at Wickerwool at Cedar Farm in Mawdesley. Cedar Farm is inspirational, if you've never been, it's a must if you're creative in any way. Wickerwool is located in the Pig Barn and is run by Ruth and Tamsin, artists who have changed a section of their studio into a wool shop. I'll be taking part in Knit in Public day at Cedar Farm, so if you fancy knitting, or spinning, or crochet for that matter, come along to Mawdesley, Lancashire and join in the fun. I promise you, you won't be disappointed. 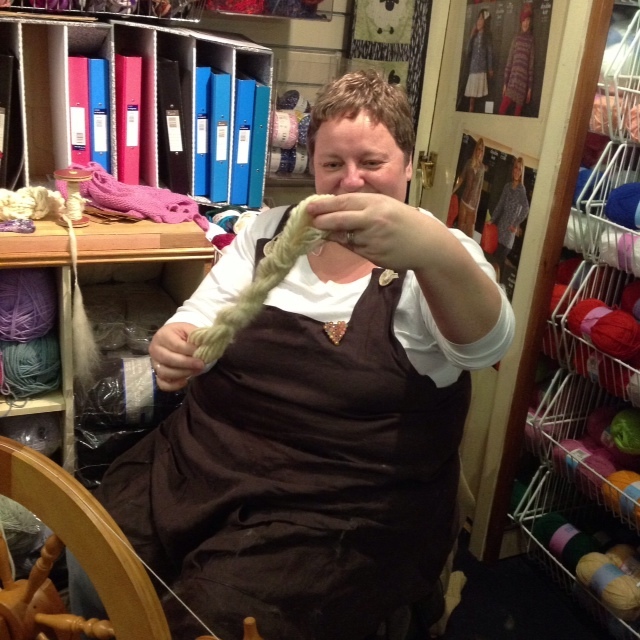 If you've ever thought you'd like to learn to spin, please get in touch, it's a wonderful craft and we'll get to share a passion and keep the crafts alive.